In late years, therapeutic drugs for hepatitis C virus (HCV) have made impressive progress. 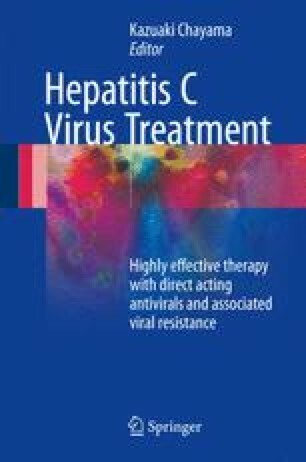 In particular, the introduction of direct-acting antiviral agents (DAAs), which target viral proteins directly, has advanced the treatment of HCV with high sustained virological response (SVR) rates and few side effects. Despite their potency, monotherapy with a single agent is not effective due to rapid selection for strains harboring resistance-associated variants (RAVs). However, when DAAs with different mechanisms of action are used together, they present a high genetic barrier to resistance and have been shown to be effective for treatment of patients with HCV genotype 1, including patients who are poor candidates for interferon therapy and patients who failed to respond to previous treatment attempts. In a phase 3 trial examining 24 weeks of dual DAA therapy with asunaprevir, an NS3 protease inhibitor, and daclatasvir, an NS5A replication complex inhibitor, in Japanese patients infected with HCV genotype 1 with a high HCV RNA titer, the SVR rate reached 81–91 %. Moreover, 94–100 % of patients without NS5A L31 and/or Y93 or NS3 D168 RAVs at baseline achieved SVR. The rate of adverse events was low, and this combination therapy was well tolerated. However, attention should be paid to AST/ALT elevation, pyrexia, and rash. Patients with cirrhosis are eligible for this therapy, but it is necessary to manage side effects carefully with consideration for the general condition of the patient. It is important to provide the best treatment currently available in the treatment of aging Japanese patients with hepatitis C to suppress progression of liver disease and reduce risk of hepatocellular carcinoma.